Note: I had the opportunity to photograph and visit with young people here on the Pine Ridge Indian Reservation looking to create awareness about suicide and bullying. Below is the story I wrote (with some edits) that was originally posted on my day job’s website. 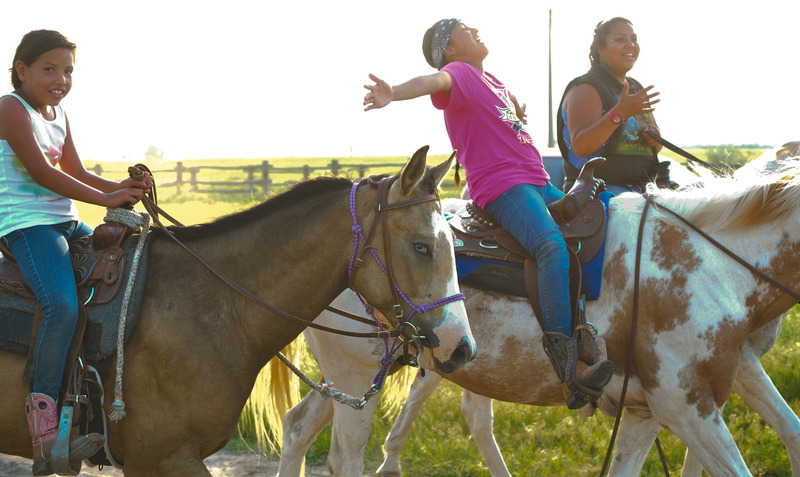 Set on horseback, Pine Ridge Indian Reservation youth recently rode from Wanblee, SD, to Pine Ridge, SD, to speak up about the epidemic of suicide. The ride took three days with stops in between the nearly 100-mile ride. Co-organizer Lauren Janis, a 16-year-old at Little Wound High School, started the organization Fight for Life along with fellow student Evelyn Quick Bear to raise awareness. They decided to launch Ride for Life as one of the events to do that. 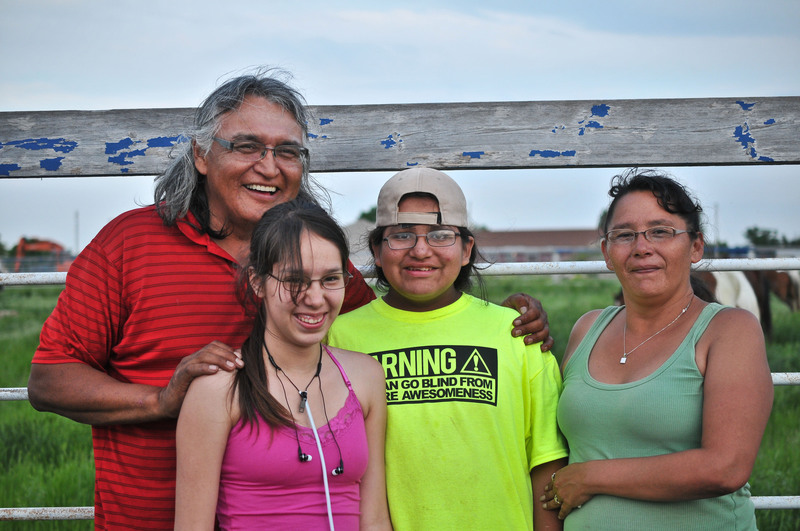 The suicide rate on Pine Ridge is more than twice the national rate with teen suicide at four times the national rate. When the Ride for Life riders stopped in Kyle, SD, to rest and eat, Lauren spoke about their expectations of the event. Rodney Bad Hand of Wanblee said the ride gives an “eye-opening” experience. He said his son Ethan, 13, has experienced bullying. Ethan chose to be one of the riders and it was his first time riding a horse at such a large distance. The effects of suicide on the community are palpable. Kim Conroy of Wanblee expressed how much it can not only directly affect the lost loved one’s family, but how it hurts everyone in the area. She mentioned that one year suicide attempts ranged from an 88-year-old woman to a 6-year-old. “We have just as much crime as an inner city – it’s just more out in the open here,” she said. Rodney Bad Hand (left) and Kim Conroy with their children Ethan (center) and Randi. Students like Ethan are some of the youth who like to participate in suicide prevention programs and events whenever he can. He said he enjoyed himself and that events like the ride are necessary. The young organizers of the Ride for Life event came up with the idea on their own but did seek some guidance from Lucas Martin, school improvement coordinator. 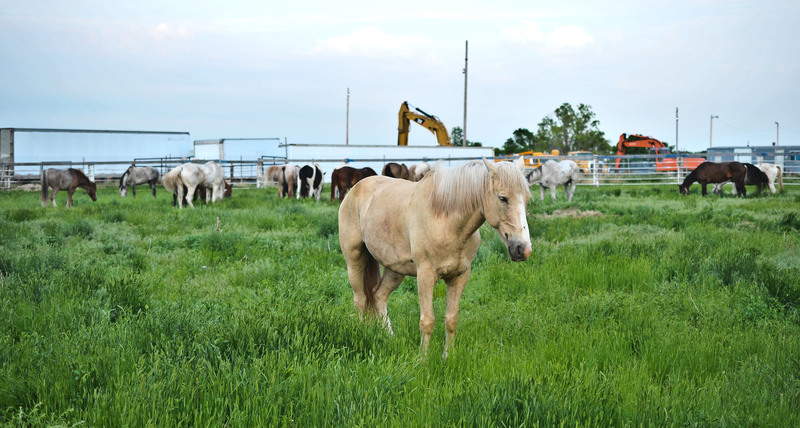 In addition, the students approached the Oglala Sioux Tribal Council for financial assistance and the funding was approved. Mr. Martin said the girls aren’t stopping with just the ride — “they want to make life more enjoyable for the reservation.” They are looking to start a nonprofit and are already preparing the paperwork. Their goal is to build an indoor athletic complex with the hope to create jobs, entertainment and hope for the future. Followed you back from your Smugmug blog comment. Nice website. Are you doing a light HDR effect on a lot of the portraits (ie Lauren above). Hi Chris! Thanks for commenting! I finally got the hang of that site I think. Still learning though. I used LIghtroom edits on these photos, justing messing with the definition and contrast. I think you are right about SmugMug….it’s cleaner as you learn it more but I have a lot to learn! Give my site a look: http://www.jenicesgummyworld.com.